For Seth Percy, being accepted into the University of Southern Maine was a dream come true. The 25-year-old electrical engineering student from Bath has come a long way from his origins. Born in Colorado and having moved to Maine as a child, Percy is no stranger to the rigors of the real world. He began lobstering in Harpswell, Maine, starting shortly after high school, a line of work he says taught him self-discipline and respect for the trade that is so important to Maine’s economy. But now in his senior year, and having picked up a concentration in computer engineering, Percy has realized both his passion for and potential in the field of engineering. “I really liked to take things apart and put them back together. … There’s something about it that made me feel fulfilled — it gave me an opportunity to express my creative side in a way I felt no other way quite captured,” Percy said. It was a passion that began in his childhood. But the desire to create, to solve problems, he said, is more personal than childhood curiosity. When, in Percy’s younger years a friend sustained a traumatic injury, he began to wonder not just if, but how, he could have helped change the outcome. It was an experience, he said, that inspired his desire to help others. Enter the field of robotics — specifically, medical robotics, which Percy is interested in pursuing after he graduates in May. Percy is currently working with Carlos Lück, associate professor of electrical engineering, to modify and program a desktop manipulator (called Microbot) to perform tasks based on Lück’s own Ph.D. dissertation and principles of redundant manipulation, optimization and semi-singularity. Plainly, Lück said, the process is closely related to artificial intelligence (AI) in that it involves the optimization of a path — a roadmap — with a starting point and ending destination. Percy was awarded a fellowship from the Undergraduate Research Opportunities Program (UROP) — a scholarly program at USM that funds student and collaborative research projects from across all disciplines — to complete his project and study in the university’s Robotics and Intelligence Systems Laboratory. The lab features six Microbots in support of the laboratory component of Dr. Luck’s Introduction to Robotics course; an additional Microbot for research use; five industrial robots: a fully-dexterous Stäubli manipulator, two SCARA robots and two Scorbots; plus several robotic devices that students have designed and built over the years as part of their senior project experience. Percy’s entrée into the world of robotics — coupled with his interest in medicine — comes as medical technology advances have allowed for robots to make more of an appearance in surgical departments across the country. According to the Portland Press Herald, there are more than 500,000 robot-assisted surgeries in the United States each year, and one in three surgeries will be performed by robots by the early 2020s. Maine Medical Center in Portland — which has three medical robots — performed 1,040 robot-assisted surgeries last year; in 2012, the hospital performed 462. Experts say the devices require smaller incisions than traditional surgical methods, making procedures less invasive with shorter healing times. Robots can also prevent strain on doctors by performing complicated movements at difficult angles. “When you think that robotics is in the hospitals, the conclusion is that health care needs engineers as much as it needs doctors and nurses,” Lück said. “Engineers are, by training, designers and problem solvers. … Engineers employ their skills not just for manufacturing — they are the problem-solvers of our society, and that transcends manufacturing. In a modern society, engineers touch about every aspect of our lives. For Percy, the future possibilities are endless. “I’ve never liked to put limitations on myself. I have always just found a lot of happiness in helping people — that’s one reason why I gravitated toward medical robotics,” he said. When he graduates in the spring, Percy may study law, or go to medical school, he’s not sure yet — but one thing is certain: he’s more than ready to enter Maine’s workforce. In addition to receiving a UROP, Percy has served as a teaching assistant and tutor for the Department of Engineering, helping put together labs for entry-level courses and grading course materials. 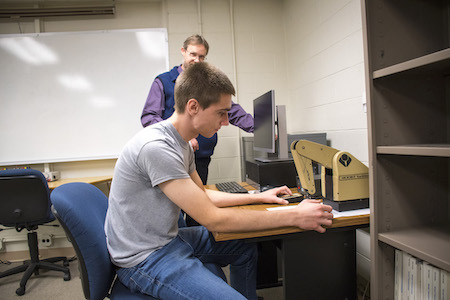 The number of engineering students studying at USM has doubled over the past decade, according to department chair Mariusz Jankowski, and the department has provided internships to one or more students at more than 70 companies. Half of the students enrolled in the department’s programs are adult-learners seeking a second career, and two-thirds of engineering graduates stay in Maine on average following graduation. 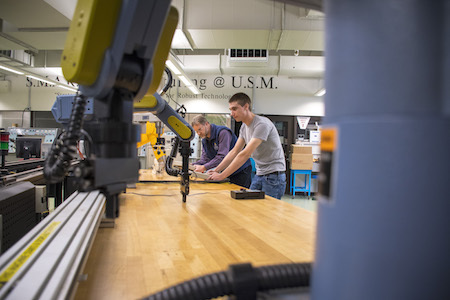 USM has graduated more than 160 skilled engineers in the past five years and, as the university explores new undergraduate engineering programs, that number is likely to grow. One of these advancements is a potential new major in computer engineering. Other investments include majors in industrial engineering and in engineering science. These major advancements in programming, plus the department’s high standards of excellence, rigorous programming and accreditation by the Accreditation Board for Engineering and Technology (ABET) are among the many reasons why Percy said he’s glad he chose USM for his studies.